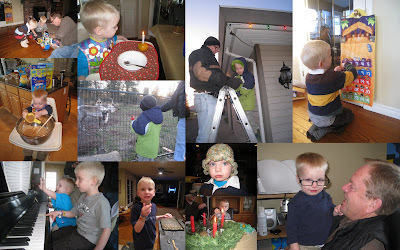 Home Again: A Weekend with the Boys! I love involving the boys as I prepare for Christmas. This weekend many things happened. "And Oma, we still didn't have time to watch a Christmas movie." And so it goes, friends. both blankets dragging along behind him. Dee Dee as he calls for his blankets. It's a bit blurry, but you got the picture. Let's find out tomorrow what was unexpected. hee, hee...love the photo of going home with his blankies. You had one full weekend! It looks like a good time was had by all! And when it was all over...Oma climbed under her blankee and slept soundly. lovely. So cute. I missed all three of my boys for sure. What is with that? Silas STOLE "MY" HAT!!!!!!! He looks better in it than I do anyway. awww... how sweet... I'll be back tomorrow as now you have me curious! Looks like a busy and exhausting week. Kids take a lot of energy and I find that I have less than I used to!